Soon after it’s publication, I received a copy of Artscroll’s biography, Rav Gifter, by Rabbi Yechiel Spero. As a close friend pointed out to me, it’s an “easy read”. This is true, because Rav Gifter zt’l was a gadol that those from America (like myself) could relate to. Moving from Portsmouth, VA to Balitmore at the age of two, he attended public school until going to NY at age 13 to attend YU’s high school. His life along with the interviews and accounts of Telz (both in Lithuania and Cleveland) are snapshots of both the destruction and rebirth of a great yeshiva. Each of the young men gave their suggestions. One suggested that Name of Hashem; another thought that it might be Melech (King). But Rav Gifter’s answer remained with this talmid some 65 years later. This entry was posted in Avodas Hashem, Gedolim, lessons, stories on July 7, 2011 by Neil Harris. So simple and life-changing in our daily brachos. Thank you. 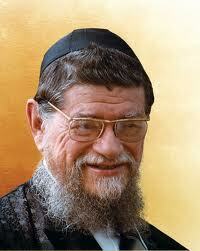 I gotta pick up the biography, b’ezras Hashem. So true. Thank you all for your comments.